Today, our objective is to finish the construct for amiRNA so that it will be ready for insertion into V0120. We will run a series of PCR reactions to replace the existing interference sequence with our own sequence using a series of primers. Then, we will sew the small pieces of DNA together in another PCR reaction. Total of nine reactions: three pieces for each GFP, Betv1, and LTP. Sewing together parts from step one with part number three of each allergen with primers A and B. Result was successful -- had bands that were ~500bps in length. 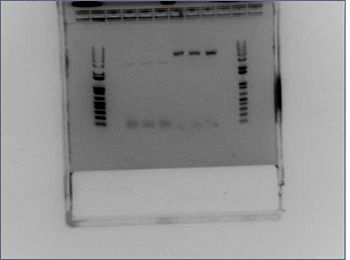 2.2 μL of DNA Loading Buffer were added to each reaction and loaded onto a 1% Agarose gel (TAE buffer). Gel was ran at 125 V for 30 min. The undigested B15 in lane 6 appears as two bands on account of supercoiling of the B15 plasmid. Ligation reactions were preformed as per the Silver Lab ligation protocol (with the differences in concentration and ratio made as per the table above). Transformations to E. Coli were preformed as per the Silver lab transformation protocol with ampicillin plates. Inoculated 3 colonies of B21 transformed E.Coli and set them to shake for 8 hours. We will maxiprep the B21 plasmid for use as a vector backbone. 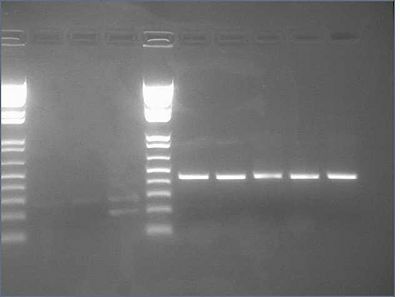 Ran 1.2% E-gel of the 6 PCR product tubes. Because colonies 1 and 2 of Barstar worked properly on last week's gel, the PCR products in those two tubes were combined and purified using the Qiagen PCR purification protocol.